My 5 week old has started to get baby acne all over her face. Do I just let it run its course or is there an ointment I should apply? 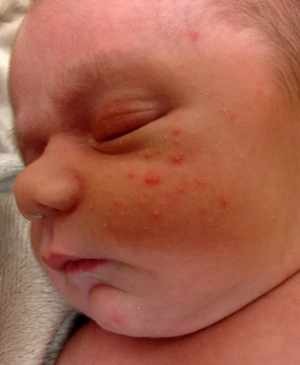 Neonatal acne peaks around 1 month of age. These red bumps resemble the zits of our teen years. 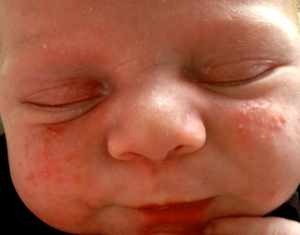 Neonatal acne begins on the cheeks and often involves the scalp, neck and shoulders. No treatment needed as neonatal acne resolves on it own. Most cases have cleared (or noticable improved) by 2 months.